A hundred years ago tonight (October 20, 1959), a party was encamped somewhere south of Winnipeg on its way from St. Paul to Red River. The party had left St. Paul on September 28 and was destined not to arrive at Red River until November 1. We do not know how many travellers there were nor who most of them were. Two we can name: William Buckingham and William Coldwell, two young newspaper men on their way to the Settlement to start our first newspaper, the Nor’Wester. With them they brought a printing press, type, paper and ink, experience as reporters and printers, a stock of books for sale, high hopes, and definite convictions about what the future of the Settlement should be. Buckingham and Coldwell were not the first to recognize the possibilities for a newspaper in Red River. A young man had set out from Owen Sound by way of the Great Lakes, but when he reached Sault Ste. Marie he learned that there was no way of taking his heavy printing press into the Settlement from the head of the lakes. Buckingham and Coldwell were better informed. They assembled their equipment in St. Paul and there they bought oxen and three Red River carts to carry it to their destination. In their account of their journey in the Nor’Wester, they stated authoritatively that the best oxen could be bought for from forty to fifty dollars a head and earnestly advised their readers against buying inferior animals. Michigan wagons, they said, could be bought for from sixty to seventy-five dollars, but they were not nearly as useful as Red River carts which could be obtained for from ten to fifteen dollars. At that time they had not sold their oxen and carts, so it is quite possible that we have here an instance of the practice, so much deplored by modern editors, of permitting some advertising material to creep into the news columns. At that time, there was still reason for people travelling from St. Paul to Red River to fear attacks by the Sioux and it was the custom to form parties to make the journey. Accordingly the young newspaper men joined a party leaving St. Paul on 20 September. The young publishers established themselves in a small building near the corner of Main and Water Streets. A city parking lot now stands on the site. They had planned to bring out their first number on New Year’s Day, but since there was an outgoing mail on 28 December they decided to meet that deadline. It was important to catch the mail as many of their subscriptions and all but five of their advertisements came from Upper Canada or St. Paul. Within three months after their arrival, Buckingham and Coldwell took in a third partner. James Ross, a native of Red River, bought a third interest in the venture. All three men were in their twenties. Courageously they undertook to bring the news to Red River, to spread news of Red River far and wide, to stir up the citizens, and to challenge the authority of the powerful Hudson’s Bay Company. William Coldwell was born in London, 1834, educated in Dublin, and came to Canada at the age of twenty when he joined the staff of the Toronto Leader. Except for four years, 1865 to 1869, when he wrote for the Toronto Globe, he spent the rest of his life in the west. The day before the anniversary of his arrival in Red River he married Jemima Ross, youngest daughter of Alexander Ross, sister of James Ross, and sister of Mrs. John Black. To judge from Jemima’s letters in the Ross collection in the Provincial Archives she was a charming, high-spirited, well-educated young woman. James Ross owned a dry goods and hardware store in Colony Gardens, and by March 14, the advertisement named the proprietors as Ross, Buckingham, and Coldwell. The management of a store would give a newspaper man as good an opportunity as any for gathering the news and feeling the pulse of the community. Coldwell was a teetotaler,  so he could not make satisfactory use of taverns for that purpose. When Buckingham and Coldwell became partners in the store, the offices of the Nor’Wester were moved to Colony Gardens, the Ross property, an area extending from the north side of Bannatyne Avenue to Alexander Avenue, and two miles west from the river with an additional two miles of haying privileges. This area today includes William, James, Alexander, and Ross Avenues, all named for members of the Ross family. Elgin Avenue was formerly Jemima Avenue. James Ross withdrew from the Nor’Wester in December, 1863,  leaving Coldwell sole proprietor until in March, 1864, Dr. John Schultz bought a partnership. The following winter a disastrous fire destroyed the office of the Nor’Wester and Coidwell’s book store and threatened his home, Sunnyside. The fire occurred on 23 February 1865, and the Nor’Wester resumed publication on 30 March, with the promise that the paper would come out every ten days until it made up for the numbers missed on account of the fire. There was no insurance. Coldwell and Schultz dissolved their partnership on 5 July 1865,  and Coldwell with his wife and three children went to Toronto where he worked for the Globe for £160 a year. His house, Sunnyside, in Red River, was sold to William Inkster for £120. In Toronto the Coldwells lived in a house about which Jemima’s brother James wrote, “She has a grand house, every room carpeted, even the stairs. She bought everything new and grand.”  This may not have all been done on William Coldwell’s salary. Jemima had inherited a considerable sum from her father. In 1867, two days after the birth of her fourth child, Jemima died,  and in 1869, Coldwell with his two surviving children was back in Red River to found another newspaper, the Red River Pioneer. Cunningham died in 1874 and Coldwell became sole proprietor. Not long afterwards the Manitoban was merged with the Standard which enjoyed a brief life. The late Mrs. Thomas Laidlaw, youngest daughter of the Rev. John Black, told me that although Coldwell was for many years an invalid, confined to a wheel chair, he was one of the brightest, happiest men she ever knew, a witty and charming Irishman. It has not been possible to find as much about the second Jemima as about the first, for no letters of hers are to be found in the Ross papers, but I am indebted to Mrs. Laidlaw for the information that she was a wealthy woman, and that she always referred to her first husband as “deceased William”. Coldwell’s last position was Parliamentary reporter for the Free Press. On account of ill health he retired in the early eighties. He died in Victoria in 1907. The third member of the trio of young editors was James Ross. He was the son of Alexander Ross, formerly sheriff of Assiniboia, owner of Colony Gardens, author of Fur Hunters in the West and The Red River Settlement. James, born in 1835, had a brilliant scholastic career at St. John’s College where he held a classical scholarship. At the University of Toronto he won two scholarships, one in Classics, and one in Modern Languages and History. He graduated with one gold and two silver medals in 1857. For a short time he was classical master at Upper Canada College. He thought seriously of entering the ministry but decided that he should return to Red River to look after the affairs of his widowed mother, his widowed sisters, and his widowed sister-in-law. Rev. John Black encouraged him to come home,  no doubt finding the administration of the affairs of his wife’s family too burdensome a task. The plan was that James Ross would take this petition to England. A subscription list was begun in order to raise the necessary funds but it did not reach its objective. John Garrioch of Portage la Prairie wrote to the editors of the Nor’Wester that the people there would be glad to help but that they had no money. He quotes one settler: “I would be glad to help Mr. Ross with all my heart but how can I? Here are four bags of pemmican; buy one and I shall be able to do something more towards showing my sympathy.”  Unfortunately it was cash, not pemmican, that was needed. How did the enterprise fare? A question which naturally arises is: What did it cost to establish a newspaper and how did the proprietors fare? In those days there was a high incidence of infant mortality in the newspaper world. Several newspapers had been established on the West Coast in the years 1858 and 1859 and most of them had already breathed their last before the Nor’Wester began publication. The Nor’Wester survived until 24 November 1869, when Riel suppressed it. Looking back in 1888, Coldwell told the Winnipeg Press Club “We were successful from the start.” We find corroboration in a letter from Mrs. James Ross to her husband. She wrote: “I was over at Coldwell’s to-day. They must be making lots of money. Jemima has so many new dresses.”  Perhaps that comment is not very good evidence as there is plenty in the letters to show that Mrs. James had little love for her sister-in-law. Publicity, advertisements and subscribers are the life-blood of a newspaper. 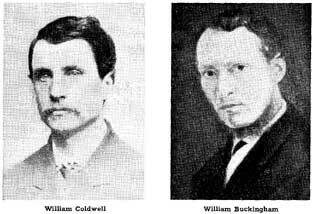 Buckingham and Coldwell were good newspaper men, and they saw to it that they had plenty of publicity before they began publication. The prospectus for the Nor’Wester was issued in Toronto and the Canadian newspapers printed kindly notices about it. In the first issue of the Nor’Wester, there was more than a column entitled CONTEMPORARY NOTICES, reprinting pieces from thirteen newspapers, articles, which announced that a newspaper was to be established in the Red River Settlement, congratulated the publishers on their enterprise, and wished them prosperity. These newspapers included four Toronto papers, The Globe, the Leader, the Colonist, the Echo, the Hamilton Spectator and the Hamilton Times, the Montreal Transcript, the Perth Chronicle, the Cornwall Freeholder, the Hastings Chronicle, the Milwaukee Free Democrat, and two from St. Paul, the Times and the Pioneer and Democrat. In case any reader missed these congratulatory notices they were run again in the second and third issues. Advertisements were six pence a line and four pence for anything over ten lines. Subscriptions were twelve shillings or three dollars per annum. The editors solicited subscriptions and advertising in Upper Canada before they left and in the United States on their way out. They obtained a measure of subsidy when the Council of Assiniboia at its meeting of 7 December 1859 passed a resolution “That all newspapers direct from the publishers at Red River be free from all postage and also all exchange papers.” Not surprisingly, this occasioned some envious comment in some of the Eastern papers. Considering the character of the Council which was appointed by the Hudson’s Bay Company, there can be little doubt that the members regretted this generosity before long when they found that the Nor’Wester policy was one of vigorous opposition to the Company. Even on their way along the Crow Wing Trail these energetic young men did not neglect any opportunities. They sold a subscription to Chief Hole-in-the-Day, who was described in a reprint from the La Crosse Union published in the Nor’Wester, of 28 February 1860, as an Indian chief living in a $6000 house on a 640 acre estate at Crow Wing. He had six wives, three old, three young, and a parlour with seventeen rocking chairs, eight large portraits, seven of himself and one of Major Cullen. The Toronto Globe in its issue of 26 August 1859, urged support: “Our Toronto merchants owe them liberal support both as subscribers and as advertisers. Toronto has a race to run with St. Paul to secure the full benefit of the Red River trade and the Nor’Wester affords the best medium for introducing themselves to those they would have as customers.” After the arrival of the first issue of the Nor’Wester, the Globe once more urged the merchants of Canada to support the new venture in the Red River Settlement. I have not been able to find any record of how many local subscribers there were. When the office of the Nor’Wester was burned in 1865, the subscription list was doubtless lost. We do know, however, that the publishers got rid of the entire first issue, because in their third issue they offered full price for copies of the first edition. We know, too, according to the Nor’Wester of 28 February 1860, when the paper was two months old, that the previous outgoing mail had been the largest up to that date sent out from the colony, and that it contained 808 newspapers, all but two of them copies of the Nor’Wester. Of these, 434 went to Upper Canada, 260 to England, and 112 to the United States. Some of these, of course, would be exchange papers. Five of the advertisements were local, two from the proprietors themselves, two from James Ross, and one from James Ellis, Dealer in Watches, Jewellery, Fancy Goods. The proprietors, under the name of The Red River Printing and Bookselling Establishment, declared that their office was equipped with a Super Royal Washington Press and that they were ready to undertake printing jobs. They also stated: “The stock of books is various and extensive and includes a judicious selection of the best devotional and other standard works well suited for Christmas and New Year’s Gifts.” It was already three days after Christmas. In the issues of 14 and 28 January, the advertisement no longer suggested Christmas presents but continued to advise New Year’s Gifts. The other notice was the one previously mentioned for an apprentice. James Ross, in his capacity as Postmaster, inserted a sixty-two line notice detailing the Rules and Regulations of the local Post Office, announcing that mail was expected from Pembina on the 13th of every month and that the regular outgoing mail would be closed on the 15th of each month and that when necessary there would be a supplementary outgoing mail on the 28th. He also had a ten-line notice stating that he would make a settlement of claims against the North West Transit Company of Canada. For the second issue the publishers were fortunate in obtaining a two-column full-length advertisement running lengthwise for AGRICULTURAL IMPLEMENTS (in letters an inch and a quarter high) of every description to be obtained at the Agency of the Albany Agricultural Works, St. Paul. This thirty-three inches of advertising, at the regular rates would bring in $8.32 an issue. It appeared in two issues. Beginning in their second issue, also, they ran for several numbers, a seventy-two line ad from New York for RADWAY’S READY RELIEF in which the readers were assured that this remedy had “cured sore throat in ten minutes”. These advertisements are interesting, not only as an indication of revenue to the publishers, but also as evidence of the variety of type which they possessed. Before long, more space was taken by advertisers. N. W. Kittson, Drygoods Merchant of St. Boniface, inserted an ad and so did Colour Sergeant MacDonald of Fort Garry who advertised the Grand Lottery of Red River limited to 150 tickets, and consisting of One Hundred Valuable Prizes worth One Hundred and Fifty Pounds Sterling. As the tickets were one pound each one wonders what Colour Sergeant MacDonald made out of it and how he paid for the advertisement. People began to advertise for lost and strayed oxen, and Robert Tait, an honest man, advertised that he had found a four-year-old red mare. Alonze Barnard announced the opening of the Red River Portrait Studio (14 February 1860). In a sizable ad James Ross offered for sale a variety of goods. The advertisement is not unlike modern poetry. Various kinds of Muslin Delaines. Ready-made Grey striped Cotton Shirts. Buckles, Augers, Padlocks, Scythes, And other articles of Hardware. By this time Ross had become a partner and it is doubtful whether this advertisement brought in revenue for the newspaper though it surely would attract customers to his store. What did contemporaries think of the Nor’ Wester? For the reception of the Nor’Wester in Canada West there is evidence in its columns of 28 March 1860, in clippings from eastern newspapers under the heading, THE Nor’Wester - OPINIONS OF THE PRESS. Diminutive in size, the Nor’Wester is nevertheless a highly satisfactory specimen of the art typographic. In appearance, reading matter, and even in size, it beats the Evening Colonist in this city hollow. As a record of local intelligence, and representative of local condition, we know of few more creditable publications ... we feel assured that Messrs. Buckingham and Coldwell are resolved to achieve success by deserving it. Who, ten or even five years ago, would have allowed his imagination so completely to run riot in his brain as even to dream that, in the last week of the year 1859, a newspaper would have been published at Fort Garry, in the very heart of that vast wilderness which extends from the great lakes to the shores of the Pacific? Even now, with this very creditable little sheet before us, for which we are indebted to the unaided enterprise of two Canadian reporters, we can scarcely realize the fact of its having been printed and published several hundred miles to the Westward of what we have always regarded as the very Ultima Thule of American civilization ... The Nor’Wester is a very neat little sheet of five columns, and contains a better variety of original matter than we could have supposed it possible to obtain among the settlers at Red River. Notwithstanding all the accidents by flood and field experienced by Messrs. Buckingham and Coldwell, and the distribution of their type, by run-away oxen on the prairies, before they were prepared to distribute it in their cases for use, and the difficulties which had to be confronted and overcome or, their journey overland, the spirited proprietors have succeeded in setting up their establishment in the Red River Settlement, and setting up their type too, in a manner which would do no discredit to a printing office in a neighborhood where all the appliances of such an establishment are easily obtainable. The paper on which it is printed is good-far superior to many of our country journals-and the typography is excellent ... It displays a good deal of ability, and is calculated to be of great use not only to the settlement itself, but to Canada and the United States, in diffusing correct information in reference to this young country. The first number ... was warmly received here, and, indeed, every where it made its appearance. It is a very creditable sheet, containing much useful information regarding the resources of the country. Well printed and vigorously edited. The 28th day of December, 1859, will be an epoch in the history of this future Province-or perhaps Empire-inasmuch as it was on that day that the first newspaper was published in the settlement. The comments on the appearance, typography and printing are in sharp contrast with the statement by J. J. Hargrave, “Its general appearance is of course inferior.”  Hargrave was a Hudson’s Bay man, to whom the Company was everything, and the colony an evil to be endured. Arthur S. Morton wrote many years later the harsh comment: “The plan of increasing the circulation by raising the dust led the editors into an attitude of hostility to the local institutions, and to become an element of discord amid the harmony of the settlement.”  This is, I think, unfair on two counts. The young editors appear to have brought with them definite convictions about what the future of the colony should be and it is hardly fair to claim that their policy was in order to increase circulation. There is also considerable question about “the harmony of the settlement.” The power of the Hudson’s Bay Company was waning even before the editors of the Nor’Wester set out for Red River, and undoubtedly there were several influential citizens in the community who were highly critical of the Company’s monopoly. This was over twenty-five years before the Canadian Pacific was completed. This is a very rosy picture. One wonders how those granaries came to be so full when according to the former extract the people of Red River had been alarmed the previous summer about their supply of food when forty Americans came into the colony. Gasden apparently bore the paper no ill will for in that issue and in several successive issues he took ten lines to advertise for a lost ox. According to the plan as outlined a Governor and a Judge were to be sent out from England, while the other necessary officials “will be left to the choice of the Local Legislature which, we are further informed, is to be elected by the people.” The editorial ends with warning about the new responsibilities and higher taxes these changes will bring about in the settlement. The Nor’Wester was not behind more modern papers in supplements and extras. In its second issue it printed a supplement of two full pages and two and a half columns containing a charge to the diocese of Rupertsland delivered by Bishop David Anderson, and on 18 February, it printed a small extra announcing that the Duke of Newcastle was preparing a bill to establish a Crown Colony in Rupertsland. It was a bold venture to establish a newspaper in the Red River settlement a hundred years ago. The yellowing files of the Nor’Wester make fascinating reading for historians, giving us insight into the economic, social and political climate of the times. Change was in the air; more people were finding their way to Red River; thoughtful men, both here and elsewhere, were questioning more vigorously than ever before the right of a commercial company to control a vast empire. The change did not come as soon as the young editors hoped nor did it come without some violence, but there can be no doubt that through the column of their newspaper they stimulated the citizens to think seriously about what the future held for the settlement and to prepare them for the responsibilities which would be theirs when they gained more voice in their own government. The writer acknowledges with gratitude her indebtedness to Mrs. Douglas Mackay who assisted in the research in the files of the newspapers, to Colonel E. A. Pridham who checked material in the Land Titles Office, to Miss Marjorie Morley, Mr. Hart Bowsfield and their assistants in the Legislative Library, to Miss Anne Henderson, and to Miss Shirl Hewitson of the Hudson’s Bay Company Library, all of whom were most generous with their help. Some years ago when material was being collected for an earlier paper on this subject the late Mrs. Thomas Laidlaw, daughter of the Reverend John Black, the late Miss Henrietta Black and the late Mr. W. S. Francis, grandchildren of the Reverend John Black, contributed useful information about William Coldwell and the Ross family. 1. A. C. Garrioch, First Furrows (Winnipeg, 1923), p. 146. 2. Toronto Globe, 26 August 1859. 3. Nor’Wester, 14 January 1860. 4. Fress Press, 2 April 1888. 5. Nor’Wester, 14 January 1860. 6. Nor’Wester, 14 March 1860. 8. Archives of Manitoba, Ross Papers, Articles of Agreement, James Ross, William Buckingham and William Coldwell respecting a copartnership in the publishing of a newspaper and printing business, 6 February 1860. 9. Canadian Who Was Who 1875-1933. 10. Nor’Wester, 15 November 1860. 11. Interview with the late Mrs. Thomas Laidlaw, youngest daughter of Reverend John Black. 12. Colonel E. A. Pridham secured this information for me from the Land Titles Office. 13. Free Press, 2 April 1888. 14. A. C. Garrioch, op. cit., p. 143. 15. E. H. Oliver (ed), The Canadian North-West: Its Early Development and Legislative Records (Ottawa, 1914), Vol. I, pp. 502-503. 16. Proceedings of the Grand Lodge of Manitoba A.F. and A.M., 1957, p. 96. 17. Provincial Archives of Manitoba, Ross Papers, Henrietta (Mrs. John) Black to James Ross, 24 December 1864. 18. Nor’Wester, 13 May 1865. 19. Nor’Wester, 17 December 1863. 20. Nor’Wester, 3 March 1864. 21. Nor’Wester, 30 March 1865. 22. Nor’Wester, 4 July 1865. 23. Olive Knox, John Black of Old Kildonan (Ryerson, 1958), p. 160. 24. Provincial Archives of Manitoba, Ross Papers, John Black to William Coldwell, 25 June 1866. 25. Olive Knox, op. cit., p. 160. 26. Provincial Archives of Manitoba, Ross Papers, p. H.
27. J. W. Dafoe, “Early Winnipeg Newspapers”, Papers Read Before the Historical and Scientific Society of Manitoba, Series III, No. 3, p. 16. 28. New Nation, 8 April 1870. 29. J. W. Dafoe, op. cit., p. 17. 30. In 1875 Jemima, widow of William Ross, sold land on Market St. to the City of Winnipeg. In 1876 Henderson’s Directory lists William Coldwell as living at Brook Bank, the name of the William Ross house. 31. Archives of Manitoba, Ross Papers, Alexander Ross to James Ross, 25 August 1854. 32. Archives of Manitoba, Aid, William Ross to James Ross, 24 August 1854. 33. Manitoban, 23 September 1871. 34. Archives of Manitoba, Ross Papers, John Black to James Ross, 5 January 1860. 35. E. H. Oliver (ed), op. cit., p. 499. 36. Archives of Manitoba, Ross Papers, Articles of Agreement, 6 February 1860. 37. E. H. Oliver (ed), op. cit., p. 499. 41. A. S. Morton, A History of the Canadian West to 1870-71 (London, 1939), pp. 857-858. 42. Nor’Wester, 24 January 1863. 43. Nor’Wester, 29 November 1862. 45. Nor’Wester, 12 December 1862. 46. Nor’Wester, 24 December 1862. 47. Manitoban, 23 September 1871. 48. Archives of Manitoba, Ross Papers, Diary of James Ross, 8 December 1869. 49. New Nation, 8 April 1870. 50. Archives of Manitoba, Ross Papers, James Ross to Margaret Smith Ross, 24 September 1870. 51. Archives of Manitoba, Ross Papers, James Ross to Margaret Smith Ross, 29 September 1870. 52. Archives of Manitoba, Ross Papers, James Ross to Hon. A. G. Archibald, 11 March 1871. 53. Manitoban, 23 September 1871. 54. Archives of Manitoba, Ross Papers, Articles of Agreement, 6 February 1860. 56. J. W. Dafoe, op. cit., p. 16. 57. Archives of Manitoba, Ross Papers, Margaret Smith Ross to James Ross, 2 August 1864. 58. Archives of Manitoba, Ross Papers, William Ross, Whitby, to John Black, 23 February 1860. 59. J. J. Hargrave, Red River, (Montreal, 1871), p. 147. 62. Nor’Wester, 15 March 1860. 63. A. C. Garrioch, First Furrows, (Winnipeg, 1923), pp. 142-143. 65. Nor’Wester, 3 March 1863. 66. Nor’Wester, 28 December 1859. 67. A. S. Morton, op. cit., p. 855. 68. Nor’Wester, 28 December 1859. 69. Nor’Wester, 28 March 1860. 70. Nor’Wester, 28 December 1859. 71. Nor’Wester, 28 January 1860.